It’s called “Housing Crisis” for a reason. 65% of the homes are renter occupied; only 35% of the homes are owner occupied. Over 60% of all rental units are in “rent controlled” buildings. In SF, rent control only applies to older multi-family buildings. It does not apply to buildings completed after June 13, 1979, and it does not apply to condos and single-family homes that are rented out. In other words, none of the newer housing stock is rent-controlled. Rent control in SF means that when the unit comes on the market, it is rented out at market rent, but annual rent increases from that point on are limited based on a measure of inflation. Even rent-controlled units are becoming less affordable: of the 160,000 rent-controlled units in 2015, about 100,000 units were rented at rates that would be affordable to households earning less than 80% of the Area Median Income (AMI), down from 140,000 in 1990. A household of two that earns less than 80% of AMI, according to the Mayor’s Office of Housing and Community Development, currently makes $75,750 or less a year. Units rented in the previous 2 years, show the erosion of affordability of the city’s rent-controlled stock. Whereas in 1990 a substantial majority of all recently rented rent-controlled units were rented at rates affordable to lower income households, by 2015, only 10,000 such available units were affordable to those households. 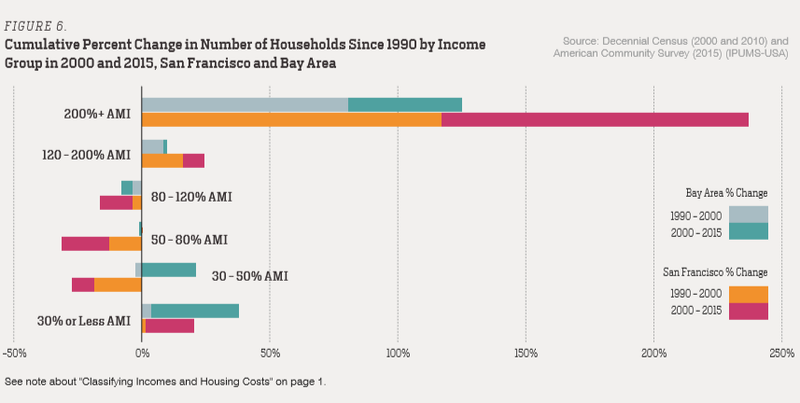 9% of households live in about 33,000 affordable housing units, where rents and sale prices are set so that they’re deemed to be affordable at low and moderate-income levels by SF standards. Buildings with more than 5 units account for 52% of the city’s housing units but occupy only 19% of its land area. Single-family homes account for 27% of the housing units but occupy 62% of its land area. In 2017, thanks to the construction boom, new construction created about 4,500 new housing units; in 2016, new construction created over 5,000 new housing units; this is way more than double the historical average since 1990 of 1,900 units per year. Practically of them were multi-family buildings. The number of households earning more than 120% of AMI (for a household of 2 = $113,650) tripled since 1990. And of them, 82% are now high-income households earning 200% or more of AMI (for a household of 2 = $189,400). The number of workers who work and live in SF has reached an all-time high of nearly 500,000. But with two of those $75,000-a-year earners into one households, the household makes $150,000. The number of high-income workers earning 200% or more of AMI has surged by 240% since 1990 with over half of that increase coming since 2000. At the same time, workers earning less than 120% of AMI – an individual worker making less than $99,500 – are leaving. In the chart below, note the increase of workers making 30% of AMI ($24,850). Would that be students? (Click to enlarge). Households earning less than 50% of AMI ($47,350 for a household of 2) face a situation where housing costs consume 50% or more of income. After the blistering home price spike earlier this year, the big fade has set in. Read… What the Heck’s Going on in San Francisco’s Housing Market? ← What Future Is Uber Seeing for Itself? Eventually, this has to all wash out, right? I think I have seen in prior reports that there is a lot of vacancies in newly built condos. Those units can’t sit empty forever, eventually someone will want to cut their losses and get the avalanche of price reduction going. I think the problem is the similar in the peninsula area and the South Bay where tons of new condos are going up, almost all of them “luxury,” read expensive, I wonder how long that can last before the inevitable bust. Commenting on: “In the chart below, note the increase of workers making 30% of AMI ($24,850). Would that be students?” — No, the low income workers are those who work in the hotel, restaurant and fast food industries from front desk to housekeeping to maintenance to restaurant workers; the Uber and Lyft Drivers; all worker bees who are ‘temps’ in the recruiter industry. I don’t want to sound like a broken record, but once you reach the point of having to spend 70% of your pay on housing you’re better off doing without. Buy yourself a nice van or box truck, spend a little money to make it habitable and homey, maybe put in a skylight and get a really nice bed so you can lay in bed at night and look up at the stars. Maybe put solar panels on the roof and get a TV to watch movies. Get a gym membership so you can shower daily and stay clean. Living in a house is nice, especially when you have kids to raise, but it is really overrated when you consider how many hours you have to spend in a cubicle to pay for it. Enjoy all the amenities San Francisco has to offer, collect a nice pay check and live happy in a van. Let the suckers in the overpriced condos pay all the taxes, you will enjoy the parks and the cheap subsidized rides on the BART that much more. Let the foreign buyers and Googlers pay all the property taxes. If you decide to go this route you will have lots of company and there are lots of youtube videos to offer advice and tips. So don’t sign that lease, don’t buy that condo, and remember you’re not homeless you’re home free! It’s an intriguing idea. As a perk, I bet you’re better at sticking with an exercise routine with those forced daily trips to the gym. And just where do all these van dweller’s defecate? Granted most will have some sort of porta-potty, but how about those living rough with little to no access to facilities? The problem with human feces in public is growing. Those who have means and ways are leaving San Franshitsco for “cleaner” locals, with far less homelessness. While those who don’t have this opportunity are trapped. Even the new major has come out, drawing attention to the growing amount of crap in public. The present real estate valuations are based on La-La Land dreams of getting rich. Soon to be replaced by the nightmare of reality. If people can’t afford bathrooms where else are they going to go? Hopefully City Hall will come to mind. Many of these homeless are in dire need of being institutionalised, for their own saftey, as well as the public at large .. but between the absurd neoliberal policy of just letting them run amok (Thanks Ronnie R. !!! ), and the liberal policy of giving them the right of no intervention against their will .. at all (Thanks ACLU, and/or other well-intentioned ?? ‘do-gooders’ !!!) this is where we are today. Maybe some of those prime condo towers can be utilized to house them … at least the poo problem would be dealt with … don’t know about the IV usage, except perhaps to jail some Big Pharm CEOs .. Stat ! You may want to educate yourself on the issue a little more before blaming Ronnie. Seems his predecessor, Edmund Brown started the process and released 41% (15,500) of patients in California state mental hospitals before Ronnie took office. And continued under Moonbeam’s first term. Been there, done that, for 10 long years, though I did rent occasionally just to keep my sanity, and I was living in the western outback, not a city. Van/RV dwelling is highly overrated. Your time is consumed with finding a place to sleep each night, staying warm or cool, trying to keep clean, staying safe, daily housekeeping chores, etc. Your so-called company is usually a bunch of hard luck people who would gladly trade for a house if they could. It’s fun for a vacation, but not full time. A lot of the so-called vandweller stars on Youtube gradually disappear after a few years and go back to living in a house. One recently killed himself (Wayne Wirs). Not recommended. The burnout rate is incredibly high and people like Bob Wells have romanticized it beyond reality. Instead of a van, move to the Midwest where you can rent a house for $600 or less. A much better life. What’s overrated is allocating 70% of your income, money you spend countless hours of your life working to earn, on a box to sleep, shower and sh_t. Here in Seattle I can (and do) park overnight almost anywhere on the street. I keep clean at the gym and use the facilities at work, gym, retail establishments and public toilets (supported by the enormous wave of property taxes being collected). I thought van living would be much worse, but it’s really kind of nice and the $3000/month I save on rent goes straight into the stock market where I expect it to keep up with inflation over time. To the guy who thinks everyone who doesn’t own or rent is a crazy homeless person, if that’s the case this country is going to be minting a lot of crazy homeless people because their are lots of people who can’t afford rent but make too much to qualify for subsidized housing. To my fellow Seattle inhabitants: have fun with your flooded basement and leaky roof next October. Been there done that. And stock markets, as we know, never crash. Living in a van is fine when there aren’t many locals doing it. If 25% of the work force did that, would there be enough parking space for people to live without hindering the rest of the moving vehicles that need to park at these parks as they come and go. You may see room for hundreds or thousands of vehicles, but is their room for tens of thousands or hundreds of thousands. People build homes for a reason, and when housing exceeds 50% of earnings the majority of the informed workers move. Detroit, Denver, Seattle, Dallas, Atlanta. Just a handful of places being inflated by people leaving California. The jobs in California have no geographical reason for being there. The ground isn’t growing internet start ups from some rare silicon soil, the hot air is supplying nothing more than Elon Musk fan boys/girls. People in California should just move, if the job isn’t worth much elsewhere maybe the job isn’t worth doing. Living in a van would be depressing, but I see a lot of retired couples living in motorhomes happy and free while they are healthy. So it isn’t a new thing, just living in a van is the depressing part, be civil and at least use an old motorhome with a bathroom like a normal person. Story in the local paper today: there are 5 times more on street parking spaces in Seattle then there are cars (worth a total of $36 billion) – so yes there is room for everyone. Also, Seattle makes parking lots available, for people who live in their cars, to park – one lot is near the football stadium. I prefer to park in nice neighborhoods, I like Edmonds, near the water. – Venture/private capital is abundant in the bay area (and, to a degree, the west coast in general). These AREN’T moving, though smaller VC and PE are beginning to pop up in other “A” locations. Look at “Silicon Beach” in LA, around the Venice area. Not your parent’s Venice anymore. – A lot of the banks that will finance safer enterprises (still risky for a bankable entity) are also located in these markets: Silicon Valley Bank being the easiest example. Most of these banks will not lend to institutions out of their footprint. – What no one has mentioned: access to the best and brightest. Stanford, UC Berkley, UC Irvine, UCLA, USC, UC San Diego, are all within the state and located in similar markets, both cost wise and talent wise. Startups recruit heavily from these places. The bay area is the most expensive place to live in the states, but San Diego and LA aren’t that far behind. If you’re a new graduate getting offered a 6 figure job in Palo Alto, it’s a much more palatable move than coming from Kansas. That said, I do think companies will leave to attract talent at a lower cost of living, I just don’t think it will be the banner companies that do most of the employing! Read the book Nomadland. Takeaway: People who live in “wheel estate” may seem cheerful at first, but they’re not. They’re our nation’s modern-day Okies and Arkies. Van – the only problem I see with your plan is, companies don’t like to hire anyone who’s “different”. This means if you don’t own the same general kind of sedan the majority of co-workers do, don’t do the same sports and activities, don’t hold – or at least profess – the same political views, you’ll have a far harder time keeping your job, assuming you can get it in the first place, which you probably can’t. In fact you need to have a car to get hired at all, as anyone in the job market knows. Even if you’re walking distance away, no car, they won’t want you. Now if you’re your town window-washer, or something like that, living in a van can indeed be the answer. But for the average person, living in a van is only what you do when living “on the grid” is no longer possible. Alex, if you own a house next to your work and walk to work, they wont hire you? Sorry but, get real. No one has to tell the HR where they live and how they get to work… I actually, Think Van has a good point, but a motor home would be beter or look aftet a boat at the marina. Just waiting for my kids to go to college..
Or maybe the big money peeps who are behind these condo building booms have lots of capitol, connections to powerful officials and excellent accountants who help the get tax breaks and favorable deals so they can hold out a long time. but ….. anyone else a little overloaded with the way too numerous articles on how the rich are doing in SF with their real estate ? I believe wolf lives in SF so that could explain the focus. If I may take liberties, perhaps the sheer stupidity that is happening with SF property costs can be seen as a microcosm of our national housing crisis and even as a “canary in the coal mine” of sorts? C’mon, the cable cars “climb halfway to the stars.” In Oklahoma City not so much. YES! SF is only ahead of the rest of the USA. Zoning laws set high minimum square footages for apartments and mandate parking spaces. Our out-dated laws force developers to offer oversized apartments. These units are meant for 1970s families. Large is expensive. So many things have changed since the laws were passed: single person and single parent households instead of nuclear families, small kitchens due to microwaves, no car due to car sharing, showers instead of baths, flat screens instead of tube TVs, iPhones and ear buds instead of a stereo with speakers. It’s time for new zoning so housing can meet our current needs. what can’t go on, won’t go on. this is a housing bubble the likes of which have never been seen in history. there will be a housing crash in the entire state of california. this will spread east all over the country. this will make 2008 look like a picnic. calculated risk blog (McBride has been pretty spot on since the beginning of the 2006 housing bubble) shows that this bubble, adjusted for inflation, is at 2002-04 levels. It may be overpriced, but not as bad as it was and without most of the no doc liar loans that brought it down last time. The housing cost in the big metros are double or triple of the 2008 peak. The fundamentals don’t make any sense in the big metros. Also in 2008, interest rates were 2 to 3 times what they are now; that has something to do with it. Your source is talking about the entire country. The only way a the Cali bubble will spill over is if financial institutions go belly up again when people start defualting on underwater homes when price start coming down. It’s doesn’t seem clear how that will play out. Will be interesting. Hopefully, we don’t have the level of job loss seen in 2008. IMO if the Chinese money has to flee for some reason, whether it be a tax/prohibition put in place on nonresident RE ownership (I wouldn’t hold my breath), or a collapse in asset prices in China requiring people to liquidate here (a la Japan in the early 90s), that would have a bigger effect around here than a domestic recession. Alternatively (and ideally if you are looking for an entry point), said collapse in asset prices would put a dent in the startup viability/IPO window on the tech side, for a double whammy which could bring prices down quickly to a more manageable level. SF will always be expensive, but these current levels are just silly. It’s a fine place to live, but it isn’t that fine. There is a post up on Zero Hedge about how the housing bubble is entering “Stage 2.” According to the author, this is the stage where, with the recent bubble peak still in memory, sellers will flood the market with inventory in an effort to lock in the gains that they failed to capture last time around. Hopefully, the flood turns to a deluge. I am sure there are some very interesting stories about who these people are (who have left), where they went, and what was the final push to move on? Plus, how did they plan their move and prepare for it? I suspect it isn’t just about affordability, although that is certainly key. In 1968 my parents sold their awesome home in Walnut Creek and packed us up for Canada. My dad also walked away from his thriving business. Because my mom was Canadian (they met during the war while overseas) the move north was relatively straight forward. But because of the times, the riots, the FBI investigations of individuals, and the IRS hassling of emigrants and dissenters, we were under strict orders not to say anything to anyone. All we could say to people who asked was, “We are moving to the Pacific Northwest”. It was a very very devisive time, and with the war raging people had strong opinions about everything. Sounds a bit familiar. All you have to do is change a few words and its ’68 all over again. This is a time of terrible upheaval and many yearn for stability; beyond simple survival. Yesterdays article about Uber and comments are a good example. Were you approaching draft age in 1968? Perhaps your parents were trying to protect you from being shipped off to Viet Nam soon after you turned 18. Architectural critic Jane Jacobs and her family moved to Toronto at that time to save her boys from the draft. She soon got involved in stopping construction of a very controversial expressway into the city core (the Spadina Expressway). Well, I left SF in 2003 because HOUSING CRISIS, does that count? And I was “only” paying $1600, for a very nice 3-BR flat that was twice as big as the house I own now. I had roommates but they all moved out and I liked living alone. But it was not sustainable. Then the very nice southern black landlady died (that’s another story), and a flipper bought the place, moved downstairs and started remodeling. As the tenant I had “first buyer’s right” I think it was called, for $950,000*. I was one of the hated tech bro contingent, making 70K, with stock options cashed in, and I knew there was no way in hell that money was going to landlords. I was acquainted with a woman who bought a condo on Hunter’s Point, 500 square feet for $350,000. I did not have $70K down payment, nor would I have paid it if I did. Weed’s not legal or easy to get, and jobs pay less. There are trade-offs. Plus I never went back to tech bro world. They would have aged me out either way, the writing was on the wall. And it’s a bunch of vicious geek pricks, just like they say. *I checked back after the ’08 Crash, and the flipper flipped my former flat at $1.25 million a year after I left, and the buyer got foreclosed in ’09. Waller St. in the Lower Haight, walk down it and wallow in the gentrification that people like me helped along. I am truly sorry for that. Not a bit sorry I left. 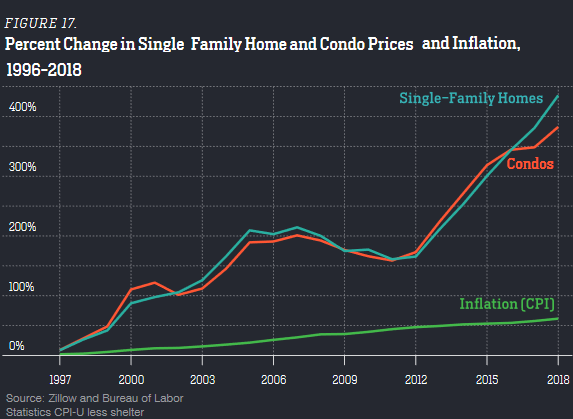 Page 26, figure 18, Housing Inflation (not shelter/rental) and CPI plotted on same chart. A sight to behold! Thanks. I should have included the chart — so I now have updated the article with the chart. So what’s going on in Daly City? Hunters Point? Is there an “urban sprawl” moment here? I mean isn’t the marina district built on fill? Why aren’t they building new housing in areas the rich do not consider worth their time? I live in the west side of city, many homes were picked up by the Chinese and sit vacant, they are a holding company for hot China money, most of which is not real. So use the fake money to sit on the Bernanke and treasury housing put….I gave all my recyclables yesterday to a 75 year old chinese lady moving around our neighborhood to pay for her food. Almost had to deck a meth head chinese guy in GG park whom was going to kick my dog on Saturday. Never use to see Chinese homeless or on drugs, times have changed….we are right at the moment the bubbles start to appear on the bottom of the pan of water with the stove on high…. I remember protesting TARP, 1 of 200 people in front of fed building back in 2008-9….today they are all protesting illegal aliens getting all your benefits for free….the sheeple are always ready to be flocked….. In a word, opportunity cost. Remember someone has to build those dwellings. Construction companies are like any other business, they will take the high end business first before the other types. Those other constructions opportunities will always be there, especially when the economics line up. There is a huge redevelopment going on of the old Naval Shipyards Hunters Point area, with tens of thousands of housing units planned. The old stadium (Candlestick Park) has already been torn down. This project is partially handicapped by numerous hiccups (corruption et al.) in the cleanup of nuclear contamination from the Cold-War. There is no urban sprawl in SF, which is about 7×7 miles, bordered by water on three sides. But there are many vacant areas to redevelop such as the vast Naval Shipyards Hunters Point area or Treasure Island which is connected to SF via the Bay Bridge, but which also has nuclear contamination issues from the Cold War (being more or less cleaned up now). Treasure Island, with its impeccable views and just a few minutes to the Financial District, will get several thousand housing units. There is a lot of supply on the way. In total, over 60,000 housing units are up in the planning pipeline. When will they be building condos on ‘the rock’ – Alcatraz? There must be a big push to develop such a prime location. Ah ! Condominiums barred none ..
.. what’s more .. they’ll build a causeway all the way to Sausilito. Chains optional. Here is a great writeup of the history, development and contamination problems on Treasure Island. It appears there is real contamination there and the holdup is not merely bureaucratic. I can see Treasure Island from our place. It’s pretty close. It’s a beautiful spot though, if they ever get it cleaned up. TI is also man-made from landfill; not sure I want to be on TI when the Hayward Fault sneezes. Hunters Point is the perfect place to show artist renderings of a sunny, planned community to a bunch of suckers who buy online (ahem, overseas investors), and then let them find out it’s built on nuclear waste and is stuck in a wind and fog tunnel….there’s a reason the Giants handed out blankets during games back in the day. 3rd Street (the main drag) is an open-air drug and gang market. I lived there for a year 68-69, we used to stand watch in the area around the barracks. There was a warning light on the breakwater on the west side, and they told us nothing about it, except that it should always be green and if it isn’t call it in immediately. Oh well one more thing I have been exposed to. Wolf, as many local frontline activist in Hunter’s Point have stated for years the ground is toxic. There is a reason BLack woman in HP, had the highest rates of breast cancer coompared to any woman in the Bay Area. Activist saw the land grab, talked about the need for a real clean up, along with the need for jobs to the community (Young BLack men unemplyment rate in HP was and is around 50%). Let alone the building of the new homes wer not from people in HP, where the last bastion of BLack people live. The clean up as activist said for almost 20 years never did the job. In my country people have time to sit in a cafe or the porch and chat or do little favors for each other. When you have a $4,680 a month monkey on your back for small 2 bd apartment, every human interaction must be monetised. If 2 people are sitting together in a cafe in SF chances are one is getting paid, there wouldn’t be any other way to make things work. This is the sometimes unnoticed social aspect the cooking frog doesn’t feel. People in other countries often wonder, why do americans think every human interaction must involve money… this is why. I also have lots of time to do favors for my neighbors. I have saved some of them thousands of dollars over the years by helping them file for their senior exemptions on their parcel taxes and I don’t charge them anything. Not everything gets monetized. Of course, it helps that my property taxes are low and that I could afford to take early retirement. If my house were located in a suburb of New York, I would probably be facing an annual property tax bill of $15,000 or $20,000 per year instead of one substantially less than that. Work/live 2 bed 1 bath apt on Tehama St. Renting for $6,200 per month. Heard this from architect friend yesterday during brunch. Very young techs (25 -28 years) pay this rent think nothing of ordering in food drink 24/7. Insanity. Best start socking away their money before the good times roll over them. San Francisco’s housing crisis is self-created. Locally they have the ability to block any new housing that doesn’t match the appearance of the existing housing. Anything that is too tall or too modern is simply denied without considering how it would help alleviate the lack of housing or the rising prices. Too much NIMBY there. NIMBY exists in any desirable area. Many SF suburbs have severe height restrictions that would make even SF look pro-developer. California’s Proposition 13 protected current homeowners from being taxed out of their homes but made it more expensive for newcomers. Prop. 13 encouraged homeowners to stay put rather than moving elsewhere and facing a higher property tax bill and, more recently, large capital gains taxes at the state and federal level. Rent control works a lot like Prop. 13, providing a great benefit for existing tenants but a great burden for newcomers who have to pay market rates, at least when they move in. Come to live in Frisko and feel like a Tuna inside in a can if you cannot afford to live alone! It ends when they’ve rebranded SF into Sales Francisco!!!! SalesForce Transit Center, opening soon in August. Kinda like the hospital ‘name change’. I live in Titusville, Florida. “The sweaty arm pit of Brevard County” as its called. T’ville is right across the Indian River Lagoon from Kennedy Space Center. I live in a 2000 sq/ft. 3/2 built in 1993. The neighborhood is full of NASA/SpaceX/Blue Origen engineers and management types. Smart, successful, high income people. I bought the house in 2001 for $139,000. Paid it off in 2013. My taxes, city and county, run about $1180/year and are getting cut this year. My insurance, here in hurricane alley, just spiked to $1044 (and I’m pissed). So housing costs me roughly $185/month. Sorry, left out the $85 annual HOA fee to keep the retention ponds mowed. Amenities: no crime to speak of, no traffic (except during rocket launches), many golf courses, boating and fishing the St. Johns and Indian Rivers, country club membership, and I’m 20 minutes from the beach, an hour from Disney (shudder), and an hour’s bike ride from Daytona. I’ve been to SF. The pretty parts are some of the prettiest on the planet. But no way is it worth that kind of stress. Lots cheaper to visit once a decade or so. To me, that sounds 10x better than San Fran. I bet you even have nice neighbors who know your name. Weather is much nicer in San Fran compared to the sweltering mosquito pit that is the Florida penninsula. Some people prefer the heat, but I didn’t. I can’t afford San Fran though, not by a long shot. Mosey up to Mendo and cool off in the Eel where 1 meets 101 best local swimming hole E.v.e.r. “sweltering mosquito pit” aptly applies. When I was a kid, before we had such things as mosquito control, my grandfather in summer time would open the door, wave an empty bucket around for a second, close the door and count how many mosquitoes he’d caught. There’d always be a dozen or so. I’m guessing a dozen mosquitoes every 6 cubic feet or so. Kent, don’t forget another perk of your locale, the best grapefruit in the world. I hope you’ve planted a couple citrus trees on your property. Indian River grapefruit is the best in the world. Unfortunately there is some bacteria wiping out much of Florida’s citrus industry. Growing is now strictly controlled and individual homeowners can be fined for planting new trees. Individuals aren’t trusted to maintain the proper pesticide treatment schedules. My grandmother used to grow pineapples in her backyard. But those were wiped out by a different bug 60 years ago. The Asian citrus psyllid and the African citrus psyllid do indeed spread a bacteria, Candidatus Liberibactor, which causes citrus greening disease. I had heard of this prior to your reply, but did not know how it has affected the region’s valuable crops. My grandparents used to live in Deerfield Beach, and they had a red and a white grapefruit tree in their yard. Nothing like grabbing fresh fruit from your own tree(s) to enjoy! Lower income folks (not sure what that means anymore) are giving them selves a raise with there cars…. Go sit on the Altamont from 4:30-8:30 am and watch the West bound zombies drive by at a blistering 20 mph…. I think 7 lanes now?? I’ve watched my quiet Central Valley home go from easy laid back and affordable way of life, too basically the Bay Area…. Nothing will ever reverse that trend now, but wow! What a difference 20 years can make. What % of workers are commuters? Not just to the big SF, but the Bay Area in general…. To me it’s all lumped together. Slightly off-topic, but I recently got back from visiting my parents in the outer bay area, and noted that on Zillow maybe 1/4-1/3 of the properties for sale are pre-foreclosure/auction. The places I checked outside CA don’t seem to have that kind of ratio. Thoughts/observations? Banks are finally unloading their remaining properties? Defaults and foreclosures are rare in a rising housing market because the homeowner can sell the property and pay off the mortgage with the proceeds. It’s when home prices stall or decline that default become a bigger problem because the homeowner may not be able to sell the property and pay off the mortgage. But I don’t yet see that happening. That said, there may be some specific issue in the area you visited. So it might worth checking into. It did seem concentrated in a few neighborhoods. One is in the process of building out, $1.4M range. They removed a vineyard to build it. Karma. Homes that are not owner occupied (in other words, are rented) should not get the benefits of proposition 13. Right now it essentially subsidizes landlords and prevents them from ever needing to sell or even consider it. The whole idea behind proposition 13 was for people in living in their homes to not have to be forced out due to rising property taxes. Landlords don’t live in their homes. They shouldn’t get that benefit. Brian has hit the problem on the head. It is Prop 13 artificially decreasing the supply of “used” homes. In my family we have a home with a property tax basis from the 1960s. In other words, the property taxes on this $1,000,000 plus home is about $500 per year (it can increase by 2% per year). If sold today, the buyer of this home would pay over $12,000 per year in property taxes. The difference between $500 per year and $12,000 per year is a very valuable asset for the owner of this home. Essentially, we pocket the difference every year by renting out the home. If we are smart we will NEVER sell this home and just keep renting it out. The property tax basis is maintained FOREVER as long as the home is passed down to the next generation of children upon the death of the owner. This is a big part of the problem, There are millions of homes in California like this that may never be sold again.